The Stratford Festival is an internationally recognized theatre festival running from April to October in Stratford, Ontario. Theatre lovers from all over the world come to see some of the best plays, productions and performers from Canada, Britain and The United States. The Parlour Inn is the ideal choice when planning your Stratford Festival and accommodations. Located in the heart of downtown Stratford, our inn is just steps from the festival's theatres and has high-quality rooms available for all festival visitors. Stay in one of our 28 beautiful guest rooms before heading to a play, performance or musical at one of the town’s iconic theatres located just minutes away. After the show, come back and have a hearty meal at The Parlour Steakhouse where cold craft and domestic beers are always on tap. The Parlour Inn’s legacy is as storied as the town’s theatres. Complete with unique and vintage details, we invite you to come explore our historic hotel as you enjoy all that the Stratford Festival has to offer. Built in 1871, it was originally called The Mansion House, and had 36 guestrooms built to serve The Grand Trunk Railway. 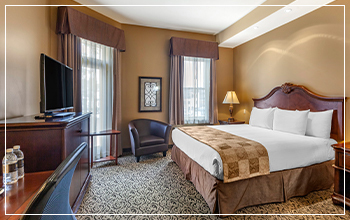 Today, in keeping with the character, charm and quality of the old building, the guestrooms are designed with unique layouts, queen and king-sized beds, and made up in luxurious bedding that will ensure your time between theatre performances is first class. Browse our selection of accommodations packages for your Stratford Festival getaway. Browse our theatre getaways to find the perfect accommodations package for your trip to the Stratford Festival. Browse our extensive selection of unique rooms and suites available for booking for your Stratford Festival holiday. Our traditional rooms feature a queen-sized bed and a dining table for two. 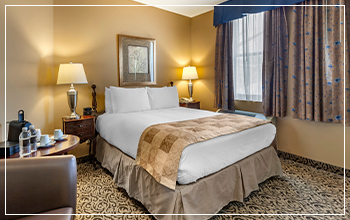 These well-appointed and immaculate guestrooms provide all the accommodations necessary for your Stratford festival trip including a three-piece bath, television, telephone and highspeed internet. These rooms are perfectly suited for those with busy theatre schedules! 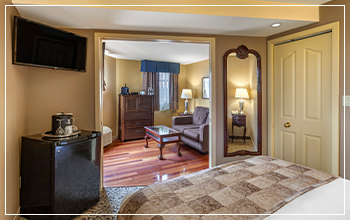 Superior Rooms are a step above the norm and are perfect for the discerning Stratford Festival visitor. These rooms have a king or queen-sized bed, sitting area and fridge. 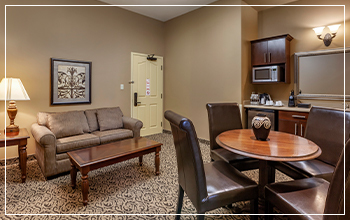 These rooms are larger than our traditional rooms and have a beautiful view of downtown Stratford. 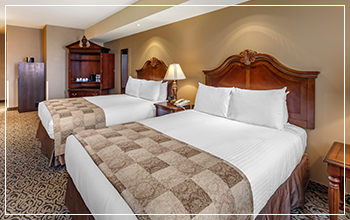 Deluxe Rooms are great if you’re bringing the whole family to experience the Stratford Festival. They offer 2 Queen Beds or 1 King Bed and are more spacious at approximately 260-300 square feet. These rooms have a minifridge and additional space to accommodate a cot. The bathroom is equipped with a whirlpool soaker tub. 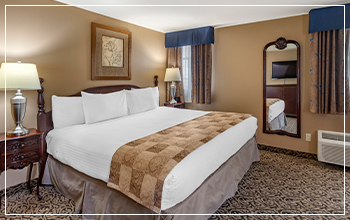 Premium Rooms offer a King Bed, mini fridge, 3-piece bath plus a luxury Jacuzzi tub for 2 within the bedroom. Perfect for couples on a romantic getaway planning on taking in a play or two. Luxurious Stratford Festival accommodations with a King Bed and separate living area. Each King Suite is individually appointed with unique features. Some may include a wet bar and mini-fridge, sofa bed, fireplace or whirlpool soaker tub. These suites offer the ideal comfort for your visit to Stratford, especially for longer stays and special getaways. Gorgeous Stratford Festival accommodations with a King Bed and separate living area. Each King Suite is individually appointed with unique features. Some may include a wet bar and mini-fridge, sofa bed, fireplace or whirlpool soaker tub. These suites offer the ideal comfort for your visit to Stratford, especially for longer stays and special getaways. Ready to book your Stratford Festival accommodations? Contact our friendly and informative staff who will help make the most of your stay in Stratford. Ready to book your Stratford Festival weekend? Call 1-877-728-4036.